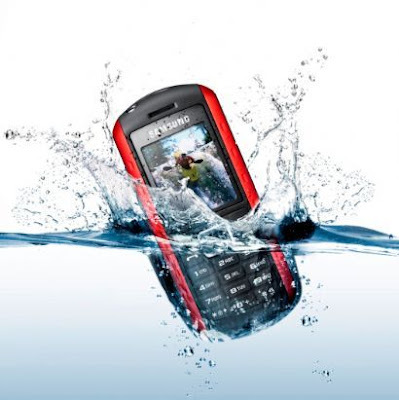 The Samsung B2100 Marine is the first dust resistance and waterproof mobile phone from Samsung that bundles high tech features and stylish bold design. 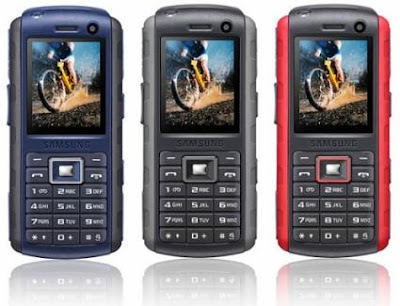 This amazing phone from Samsung is rated to withstand blowing rain, salt fog, shock, dust, humidity and extreme temperature conditions. Urethane is used in the phone which makes the cell phone shock proof. The phone also features other outdoor friendly features like noise cancellation features and loud external speakers. The phone features a TFT display screen of 1.77 inches with resolution of 120 x 160 pixels and 256k colors. Tune into some great music and non-stop entertainment with the Stereo FM Radio and Music Player. 1.3 mega pixel camera with flash with high image quality of 1280 x 1024 pixels and video recording at 15 frames per second. The camera also features 4x digital zoom for distant photography. The Samsung B2100 Marine is available in Red, blue and black color and features a sleek design having dimensions 113 x 48.9 x 17.4 mm and weights 103 grams. This splendid mobile is priced at around $120(USD); RS.5700(INR) approx.